…ready to improve your oral health? …tired of having crooked teeth? …unhappy with the overcrowding in your mouth? …ashamed of the gaps and odd spacing between your teeth? …sick of feeling embarrassment every time you open your mouth? That’s alright! There’s no need to despair because help is on the way! At Dores Dental of Longmeadow, MA, we can set things straight with the help of a short-term orthodontic treatment that works for adolescents AND grown-ups. That’s right, if you are an adult with a less than perfect grin, you didn’t miss your window of opportunity to get a better smile, back in middle school. The system known as Invisalign relies on a series of clear, almost invisible plastic aligners to discreetly straighten out misaligned teeth without drawing unwanted attention to your mouth while it is under renovation! The whole thing is mapped out in advance and carried out in bite-sized increments, so to speak! We are confident that the benefits of using Invisalign, as opposed to a more conventional approach, will become immediately clear to you! You get to switch your aligners out at home every two weeks or so. That’s all it takes to keep the process moving forward. Because there won’t be any mandatory monthly in-office adjustments, Invisalign doesn’t feel like it is eating away at your free-time in the same way that a typical orthodontic treatment would. Think about it: once old-fashioned metal braces are installed in your mouth, they would have be there for the duration of your treatment, which usually lasts 2-3 years. You don’t get a break! Invisalign aligners, on the other hand, are designed to be removed whenever you deem it necessary to do so. Because you can take them out when you are eating, they won’t trap food particles like metal braces. As such, you won’t have to avoid the foods that you love. Plus, you won’t need special tools for cleaning, which brings us to our next benefit! Regardless of your age, you will love how easy it is to keep your mouth fresh and clean with Invisalign. All you have to do is remove your clear braces, rinse them under lukewarm water, and pop them back in when you are through. What’s more, you can also keep brushing and flossing your teeth just like you always have. If you are looking into Invisalign for your teen, rather than yourself, you will have special concerns. Look, we can certainly appreciate that orthodontic treatment is a significant investment of your time and money. We also know how wishy-washy teenagers can be sometimes! That said, everyone involved wants the treatment to be a runaway success. That’s why Invisalign has come equipped with a special feature to allow you to hold your teen accountable for following the directions properly. Yep, there is actually a built-in monitoring system to make sure the treatment keeps moving forward without any interruptions. Instead of spying on them or nagging them about following through, all you have to do is check their equipment. This is how it works: when the aligners are worn properly, a small blue dot on the back of the aligners will slowly disappear. This will let you know that everything is still on track. Sounds good, right? For the right candidate, Invisalign can work wonders. And it is able to work its magic in a fraction of the time that conventional braces would take to deliver the same great results. As you can imagine, the treatment timetable all depends on the severity of the issues that we are working to resolve. That said, Invisalign usually wraps up in about a year, which is much better than the 2-3 years regular old braces would necessitate. By the time we are through with you, you will be blown away by the results. The health and appearance of your smile (or your teen’s smile) will be better than ever before! You know that you deserve a better smile and all the things that go with such a transformation (increased confidence, happiness, etc.)! As such, we hope that you will be inspired by today’s blog post to see if Invisalign could solve your orthodontic issues? 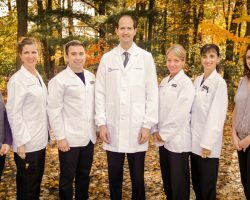 Just contact our Longmeadow, MA office to set your appointment for an orthodontic consultation! Why not start your smile transformation today?